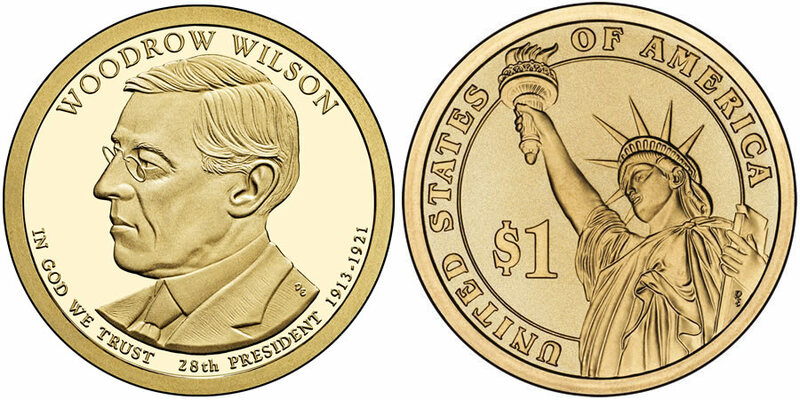 Offered by the United States Mint in 2013 as the last of four strikes of the year in the Presidential $1 Coin Program is the 2013 Woodrow Wilson Presidential $1 Coin. Shown on the obverse of the strike is a portrait of the 28th US President, Woodrow Wilson. This series debuted in 2007 with a coin honoring the first US President, George Washington. Since then, additional former US Presidents have been honored in the program at a rate of four per year in the order in which they served. The program is scheduled to continue at least into 2016. It may be extended, however, if additional qualified individuals need to be honored. Former Presidents may be honored under the terms of the authorizing act (Presidential $1 Coin Act of 2005) if they have been deceased for at least two years. Woodrow Wilson assumed the office of President of the United States of America on March 4, 1913. He served two terms in office leaving the White House on March 4, 1921. His second term in office is remembered as the time of the US involvement in World War I. Shown on the obverse of the coin is a portrait of the 28th US President, Woodrow Wilson that was designed and executed by United States Mint Sculptor-Engraver Don Everhart. His portrait is surrounded by the inscriptions of WOODROW WILSON, 28TH PRESIDENT, 1913-1921 and IN GOD WE TRUST. All Presidential $1 Coins have the same reverse design showcasing an image of the Statue of Liberty. Don Everhart designed the image which is surrounded by the inscriptions of "UNITED STATES OF AMERICA" and "$1."